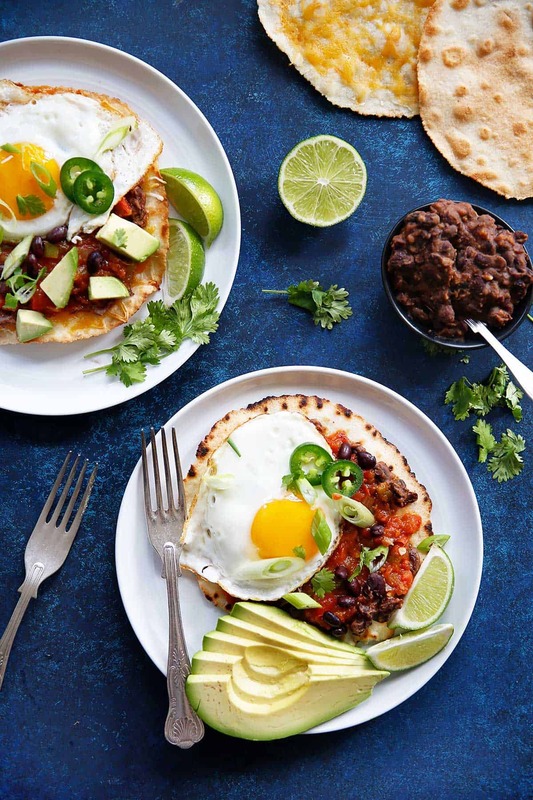 Looking for the perfect Huevos Rancheros? 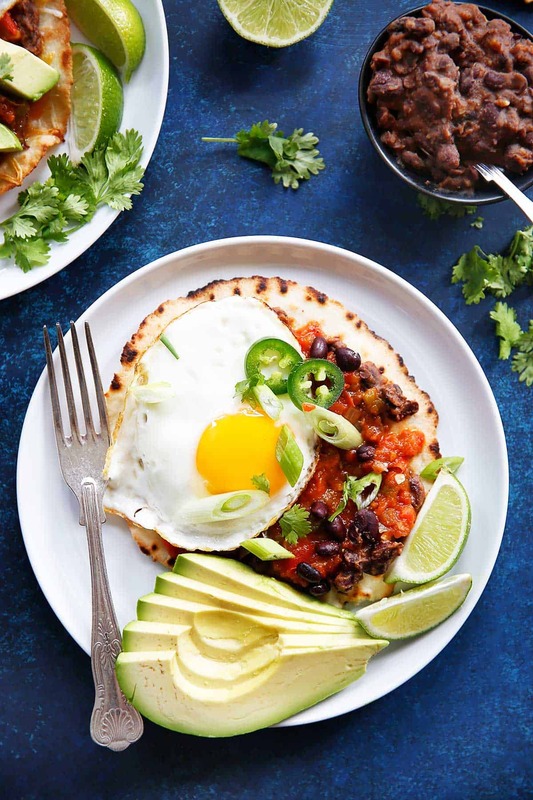 This classic Mexican breakfast is made with a hearty tomato sauce, homemade refried black beans, topped with the perfect fried egg, and all the fixings! Easy enough for a weekday breakfast and perfect for a festive weekend brunch! I am so excited about today’s post. 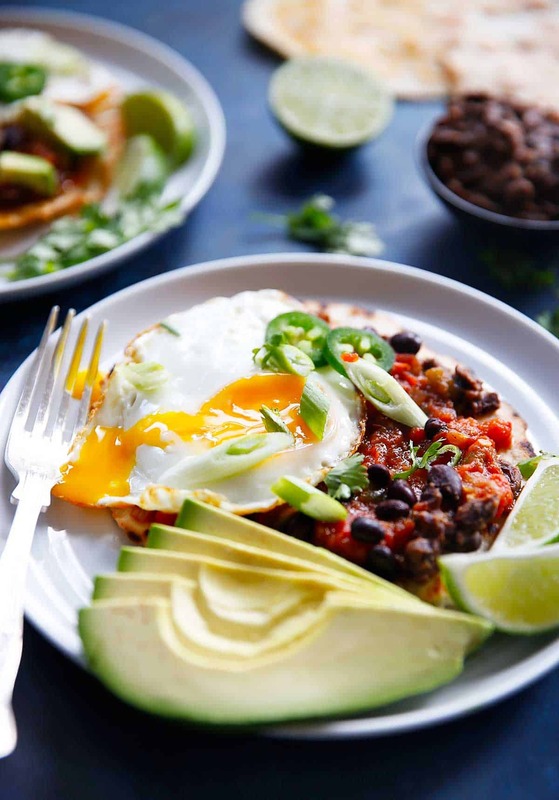 Huevos Rancheros are one of my all-time FAVORITE brunch recipes, and I’ve finally made my own! Use my Homemade Tortillas or my new favorite grain-free tortillas for the ultimate breakfast, brunch, lunch, or brinner- any day of the week. Avocado and ALL THE TOPPINGS! A squeeze of lime and it’s time to eat! Optional: 1/4 dried chili pepper, finely chopped. Depending on the type of dried chili you use, it could be very spicy. Depending on how much you love spice use more or less. If you love spice and want to try more, hold off on adding chili powder until the last step. 1 lime, sliced into wedges to serve with! In a medium skillet over medium-high heat, sauté onion, peppers, and garlic for 2-3 minutes until fragrant, or until onion begins to turn translucent. Add in all spices, except for the dried chili if using, and cook for 1-2 minutes until fragrant. Pour in crushed tomatoes and bring the mixture to a simmer. Simmer for 5-10 minutes. Taste and adjust spices as needed. If the sauce is too chunky, place in a high-speed blender and pulse. If using the optional dried chili, mix in after blending. While the sauce is simmering, make the refried beans. Heat oil in a medium saucepan over medium-high heat. Add in garlic and spices and let cook until fragrant, about 1-2 minutes. Drain the liquid from the beans and rinse well, then add the beans to the saucepan. Turn down heat and stir well. Add in lime juice and water. Simmer for 1-2 minutes. Take off heat and mash well using a potato masher or fork. Set aside until ready to serve. In a large skillet, heat avocado oil over medium-high heat. Add tortillas and cover the skillet. Heat until slightly browned on both sides, should take about 2-3 minutes. If using cheese, place 3 tablespoons of cheese on the tortillas once you have flipped them once and cover until the cheese has melted. Place the tortillas on a plate and set aside. Assemble: Spread huevos rancheros sauce on each tortilla. Add the refried black beans, scallions, cilantro, jalapeno, and top with an egg. Squeeze a little lime over the eggs and devour! 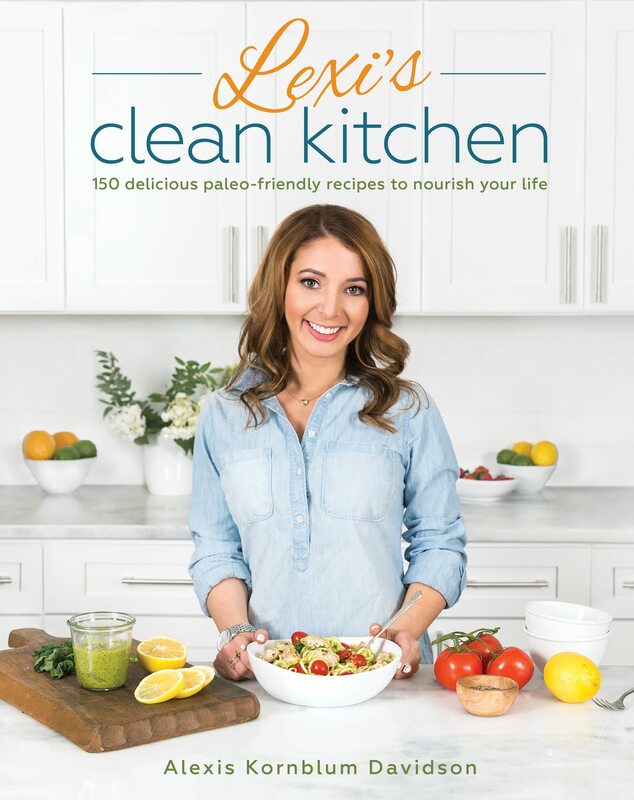 *Check out how to cook eggs all different ways on page 66 of the Lexi's Clean Kitchen cookbook! Check out these 4 other healthy and delicious Mexican recipes from my blogging girlfriends! We’ve developed a fool-proof, super-simple baked chilaquiles recipe that’s packed with protein (thank you beans and eggs!) and Mexican flavor! These Mexican avocado egg salad wraps make for a perfect low carb veggie packed lunch! Paleo Avocado Egg Salad seasoned with Mexican spices and jalapeno, then all wrapped up in collard greens! 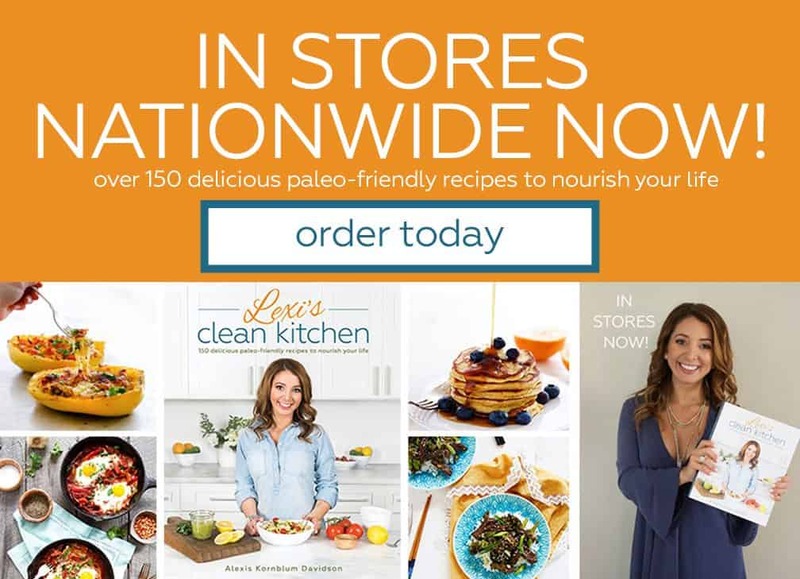 Whole 30 friendly. This quick and easy, gluten-free Shakshuka recipe has a little, spicy Mexican twist! It’s a lower carb, healthy and whole30 compliant dinner or breakfast! These sheet pan shrimp fajitas make for an easy weeknight meal with Mexican flavor. Simply bake your shrimp, peppers and onions together on one sheet, load up your tortillas and enjoy! This turkey chili pie combines a healthy, leaner turkey chili recipe with a hearty gluten-free cornbread topping, all baked together in one skillet. 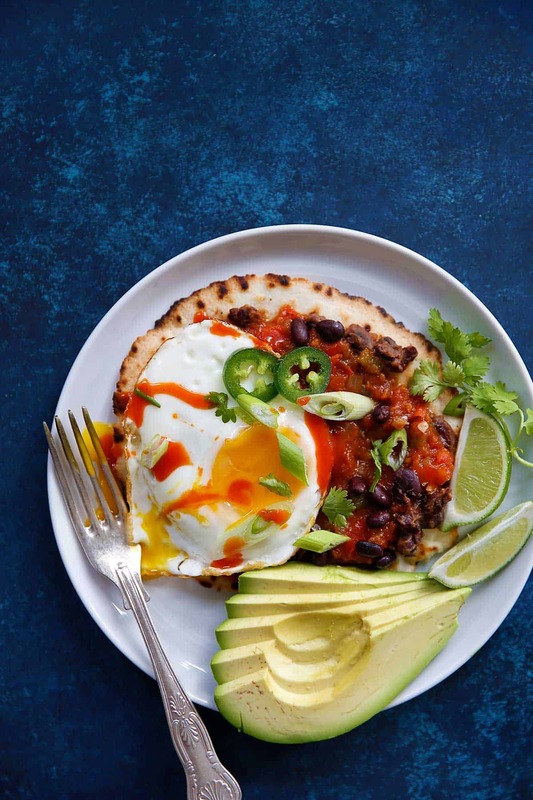 We first had Huevos Rancheros on your honeymoon and now I am in LOVE! Can’t wait to try yours! Hey Lexi! I love your recipes and make them all the time, but I’ve noticed lately when I go to pin them (including this one) the link that connects to Pinterest is just a link to your blog and not that specific recipe 🙁 maybe I’m doing something wrong but I thought id comment to see if this is common or just me! Thank you so much for sending this. We’ll look into it ASAP! It makes me sad I was just in Mexico for a week and didn’t have this for breakfast once. Gotta make up for it at home now! 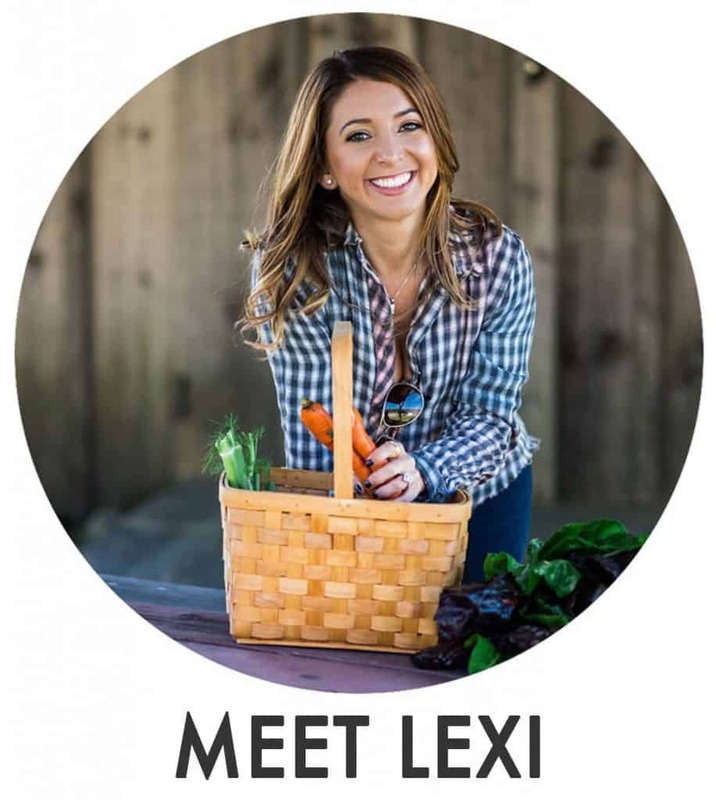 I agree with the others, Lexi…this dish looks absolutely delish! Good advice on holding off on the spice too; it is very easy to overdo this, especially if you are not used to spicy food. Thanks for being so generous and sharing this with us!